Pono’s mentorship program fosters in-depth, guided exploration of subjects chosen by Pono students ages six and older, allowing the children to work with experts who share their knowledge. A mentorship may last for one term or up to two years, depending on the selected topic and the scope and scale of the work the students plan to produce. Students meet with mentors on a weekly basis. Mentorship programs at Pono have included the production and publication of The Earthsavers, an eight-chapter comic book, and a musical adaptation of the book, written and performed by the students; a songwriting program, in which students wrote lyrics and music for songs which they performed at a concert; an art and history program, in which students learned drawing techniques and historical context to draw New Yorkers affected by the Civil War; an exploration of New York’s first people, slavery, immigration, and New York’s role in the American Revolution, using resources from the New-York Historical Society; and a collaboration with working artists to create pieces in various media for a gallery show at Pono. Pono’s art mentorship program joins older Pono children (ages 6+) with artists to create artwork in a variety of media for the students’ upcoming gallery show. Artists include Ali Dineen, Heather Anne Halpert, Bek Millhouse, Jen Neal, Sahana Keshav Prasad, Travis Southworth, Lieh Chen Vertuoso, and David Zukas. The students will work with various other visiting artists during the course of the mentorship. Each teaching artist guides the children to create a piece that ties in with that artist’s own particular body of work. For example, Sahana Keshav Prasad, a textile artist, printed a map of New York City on fabric and asked the students to embroider their favorite places on the map. Together, they created a community map that speaks of their place in the city. David Zukas, whose paintings are created on doors, invited the children to collaboratively paint their own door. He considers doors a “gateway...we must physically and emotionally pass through in order to better comprehend ourselves.” The students are encouraged to consider the inspiration and meaning of the works they make. On August 25, 2018, the students will present their artwork at a gallery in the Pono space. Their work will be for sale, with all proceeds going to Pono’s educational programs. For the fall term, the students requested to learn more about history and art. The New-York Historical Society’s The Art of History program integrates both of these areas, allowing children to explore New York history through art and social studies. 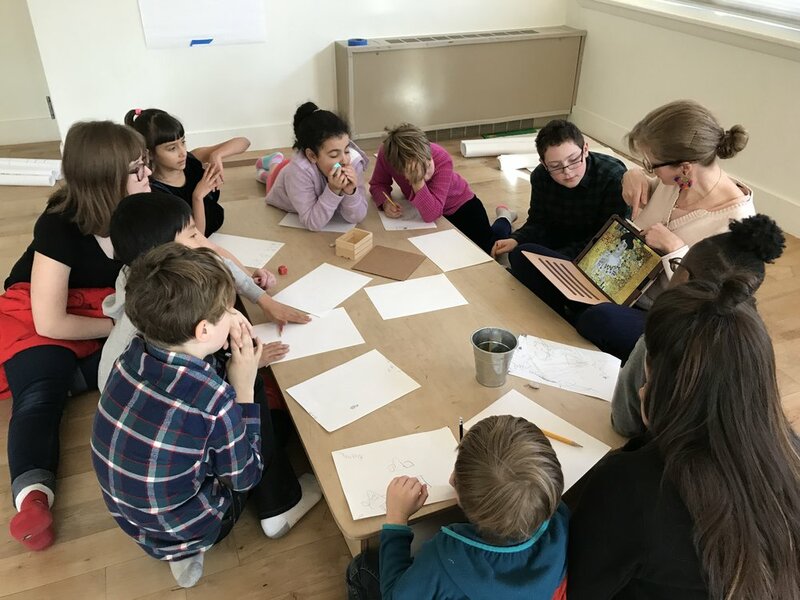 The Pono children examined the question, “How did the Civil War affect New York City and its residents?” with artist and educator David Zukas. He instructed the children at Pono in drawing techniques, as they created portraits of New Yorkers affected by the Civil War. David encouraged the students to consider the backgrounds of the people they drew and gave them the historical context necessary for such an exercise. As part of their mentorship, the students also participated in the New-York Historical Society’s Social Studies Enrichment program. History educator Paul Swartz used resources from the museum’s collections to guide the children’s exploration at Pono of the following topics: New York’s First People, Slavery in New York, the American Revolution in New York, Immigration, and New York, the New Nation. The students gained a nuanced understanding of their city’s history and of artistic expression through the Pono mentorship program. Over the course of two years, the older Pono students wrote, illustrated, and published The Earthsavers, an eight-chapter comic book. They worked with Pono’s literacy instructor to write their story, and later, to adapt the book as a musical, which they performed for the public. The students also studied with working artists, who taught them drawing techniques and guided them in the points of comic book illustration. The Earthsavers is currently sold at major bookstores in New York City. During this time, other students participated in a songwriting mentorship program. The students wrote original lyrics and melodies, as they studied with professional musicians. The instructors taught them song structure, notation, and melody, and also coached the students in vocal technique. As a culmination of the project, the students recorded their compositions for a CD and performed their songs in a public concert.